The race for Virginia's U.S. Senate seat is getting personal. Tim Kaine and George Allen faced off Monday night in a critical live televised debate in Richmond, where Allen, a Republican, criticized Kaine for accepting a job as Democratic National Committee chairman while still governor of Virginia. “How does a governor decide to take on a second job that sends him all over the country, giving partisan speeches, while over 100,000 jobs are lost here in Virginia?” Allen asked. Kaine defended his past. “I’m proud of the fact that when I was governor at a very challenging time, we did a lot to bring new businesses to Virginia and to have a profile that was significantly better than other states,” he said. 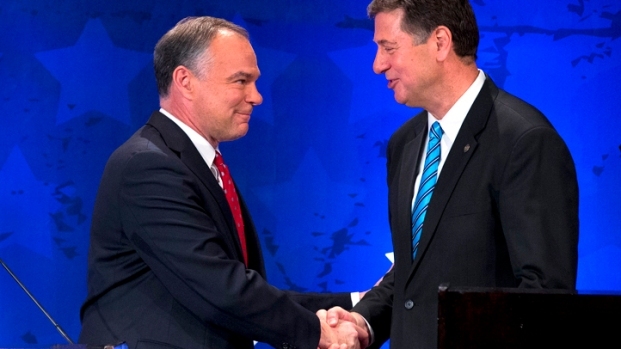 The tight race for U.S. Senate in Virginia is heating up. Democrat Tim Kaine and Republican George Allen face off Monday night in a critical, televised debate. News4's Northern Virginia Bureau Chief Julie Carey reports from near Richmond at how each candidate looks to gain an edge. In advance of the debate, both candidates released new TV ads Monday. Kaine's feautures Sen. Mark Warner, underscoring a point both Allen and Kaine are trying to drive home: That they can work across party lines. Allen's latest ad focuses on Virginia's looming budget cuts, which could hit the defense industry hard. The race has been a dead heat until the past few days. Now polls are showing that Kaine is inching ahead. While Kaine has outraised Allen in campaign contributions, outside groups like Crossroads GPS have spent tens of millions on ads against Kaine. Both candidates have served as governor of Virginia, Allen from 1994 to 1998, and Kaine from 2006 to 2010. They're looking to succeed Democrat Jim Webb, who has said he plans to retire. Allen is hoping to win back the Senate seat he once held; Webb defeated him six years ago. The final debate of this race will take place next week at Virginia Tech.